Sure I’m the girl who gave you candied bacon, followed naturally by Candied Bacon Fudge; but I never really considered bacon as anything more than just another ingredient. However strangely enough, when we became the proud owners of a smoker my first thought was BACON! Crazy, right? Or perhaps not… Anytime I can figure out how to make something from scratch that I’ve ALWAYS had to buy, I do. Bacon seemed to fit that criteria perfectly! The more I considered bacon (be it homemade or store-bought) the more I began to see it’s inherent value. What would Quiche Lorraine be without bacon? And how sad would that BLT sandwich be without good ol’ bacon? Not to mention my roasted brussels sprouts or mashed turnips. I quickly came to the conclusion that bacon is in fact much more of a superstar than I’ve been giving it credit for. Last summer was the first time we attempted curing and smoking a pork belly. I couldn’t find one recipe that seemed exactly right, so I cobbled two of them together and dove headlong into the process. The resulting bacon was not exactly a success. It was bacon all right but it was extraordinarily salty bacon, way too salty to be eaten on it’s own. I ended up using it in a variety of yummy recipes, but my desire to create the perfect slab of homemade bacon still loomed large in my little foodie heart. 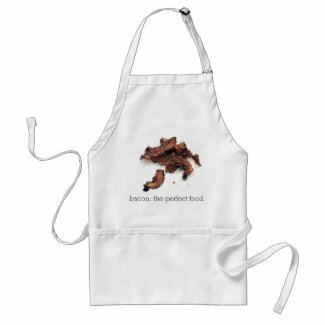 I spent the winter on a mission to find what I deemed the ideal bacon recipe, I was a girl obsessed. And then I found it. A recipe from Whole Foods for Brown Sugar-Black Pepper cured bacon. Naturally I tweaked the recipe a smidge (come on now, you know I can’t help myself!) but followed the curing directions to a tee. And guess what happened? Deliciousness baby. Total and absolute deliciousness! We ate the bacon just as is. We ate bacon and egg sandwiches (on homemade english muffins). We ate black-eyed peas with bacon, brussels sprouts with bacon and maple syrup and one of my all time favorite side dishes— braised collard greens with bacon. We were in a bacon stupor and damn we were happy. Bacon. Possibly the world’s most perfect food. Rinse pork belly and then pat dry with paper towels to remove excess moisture. Combine salt, brown sugar, granulated sugar and back pepper in a mixing bowl. Place half of the mixture in a large lidded container. Add the pork and cover with the remaining salt mixture, being sure that it is fully submerged in the salt. Cover and refrigerate the pork belly for 1 week, checking on it once or twice to be sure it’s still fully covered with the salt mixture. This will “cure” the belly, creating salt pork (a.k.a. unsmoked bacon). Remove the pork from the cure and rinse well under cold water. Fill a bowl large enough to hold the pork belly with water and submerge the pork. Allow to soak for 30 minutes then pat dry with paper towels and place on a rack fitted in a large rimmed baking pan (a lasagna pan works well). Refrigerate, uncovered, overnight to air-dry. Prepare the grill (or smoker) for indirect cooking over very low heat. Add 1 wood chunk (such as hickory or pecan) to the charcoal, or add 1 handful of the wood chips to the smoker box of a gas grill, following manufacturer’s instructions. Close the lid. When the wood begins to smoke, place the pork belly over indirect heat. Thinly slice, cook and enjoy! Even if you’re unfamiliar with collards and don’t really think you’d like them, this recipe will change your mind. It’s honestly one of my most favorite things to eat. Dice the bacon, add to an already hot stockpot and allow it to crisp and the fat to render, about 5-8 min. Rinse the collard greens and remove the tough center stem of each leaf. Stack a few leaves together and slice them into thin strips. Repeat with the remaining leaves. Add the diced onion and garlic to the bacon fat and saute until the onion is translucent. Add the beer to deglaze the pan, being sure to scrape up any brown bits that have formed on the bottom. Happy unofficial start of grilling season! The weather here in the Northeast keeps fluctuating between Africa hot and turn the heat back on cold, but the calendar reads June so it must be time to break out the grill tongs and light up the Weber. We use our grill to make dinner nearly every night when the weather is warm. From burgers and grilled veggies to beer can chicken and steamed shellfish with grilled bread. If we can grill it we usually do. The thing about making dinner on the grill is that it turns an otherwise rather solitary and sometimes mundane task into lovely “this is what I love about warm weather” time. The dog and kids running around the yard, my husband and I relaxing with a glass of wine, the last rays of sunshine filtering through the trees… Ahh it’s all good. Grilling for your family is pretty easy and low pressure, but grilling for a crowd is a different can ‘o beans all together. Suddenly you have to worry about everyone liking what you serve, the amount of time away from your guests cooking is going to require and will there be enough for everyone. After years of trial and error my husband and I have settled on two never fail recipes for our summertime parties; the first one is Barbecued Ribs. My rib recipe is easy to make, seriously delicious and can feed a crowd in a flash. Throw in a pot of my Smokey Baked Beans and some Homemade Cornbread and your guests will never want to leave! Our second no fail party pleaser (and truthfully the one we rely on most often) is marinated flank steak. I like to serve flank steak because its perfect for sandwiches, salads or just on its own and it takes almost zero time on the grill (which means less chance of an overzealous cook incinerating it). I’ve been playing with my marinade recipe for years and I finally got it to where I think it’s perfect enough to share with you. (See how much I care about you!) The marinade is fairly simple; soy sauce, garlic, lemon juice, brown sugar— but the impact is major. And if the scant leftovers are any indication of how much the crowd likes it… well then we’re clearly onto something good. Be sure to throw the onions and garlic from the marinade in a pan on the grill and serve them along with the sliced meat. They’re delicious! In a large bowl with a lid, add all the ingredients and stir with a fork being sure to break up any brown sugar lumps. Taste the marinade and make any seasoning adjustments needed then add the flank steak. Press the layers of steak down so that they are fully submerged in the marinade, cover and refrigerate overnight. (Rotate the meat, top to bottom, at least once.) In the morning drain off the marinade but be sure to keep all the onions and garlic, you’ll want to heat them up to serve along with the meat. One hr. prior to grilling remove the container of flank steak from the fridge and allow to come to room temperature on the counter. Heat the grill. Place the steaks on the hot grill and allow to cook 4 to 6 minutes per side, until nicely browned. Check for doneness with an instant read thermometer (medium-rare is between 125-130°F.) Transfer steak to a cutting board and let rest for at least 5 minutes. Slice thinly across the grain at a slight diagonal and serve along with the cooked onions from the marinade.